I've run the Chuckanut trail network many many times, and the Chuckanut 50k has become an early season tune-up staple race for me. Of all the times I've run these trails, I can't recall a more ideal day of weather, and I only wish I could've capitalized a little better (or ideally, a LOT better as long as I'm making wishes). I don't think it's necessary to go into great detail, nor do I particularly want to relive the experience in great detail, so I'll keep it brief. The brief summary is that I've realized extreme sleep deprivation (caused by newborn babies) translates to extreme exhaustion in general and markedly poor running performance. In addition to completely dead legs from the start, I was amazed by how quickly the negativity demons (which I normally only encounter only deep in the dark of night in the mountains during 100 milers) found me and attacked with full force. It was rough running through such mounting self doubt and negative thinking, but thankfully the weather was truly gorgeous and the views spectacular. It was great seeing many friends out there and Krissy Moehl put on a fantastic race this year- everything went great and couldn't have been better. The speedy crowd running this year was inspiring to see, and it was amazing to see the depth of the field and the large number of really fast times run. Congrats to all who ran, many thanks to Krissy and all the fantastic volunteers who made the race happen, and thanks for the motivation for my next race... whatever and whenever that may be! Time to lick my wounds, train hard, and move on to the next one. Mate - sorry to hear you didnt have your best race at Chucky. I struggled a bit throughout the day and it took me up to the top of chinscraper before I started to feel anywhere near good. But like you said, it was a fun day and great to see alot of top performances. Hey man! Sorry about my delayed response to you on this, but hope you are well. 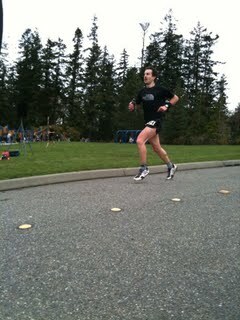 Great seeing you at Chuckanut and congrats on a strong run! Hope you're doing great, and hope to see you on the trails again soon.